No way to get bored walking around Lisbon! The sun, the architecture, the nature and the street art. Nine days and 550 pictures for our photo travel guide! Lisbon true colors! Lisbon received us with a sunny and warm weather. We arrived early in the morning after a 7 hours bus trip from Madrid. As I already wrote in previous posts: buses are cheap, comfortable and reliable in western Europe. The company that we choose was Alsa (good network through Spain and Portugal), the tickets cost €44 per person. Not bad at all! Doesn’t matter where the accommodation you booked is, for sure you will have to walk hill up and down to get around the city. So pay attention to the name of your street, sometimes all the buildings look the same with their colored tiles and clothes hanging outside. That’s Lisbon, and those peculiarities make the city so special. Hanged clothes. They are all around the city. Lisbon is definitely a visual city. Everywhere you look there is a unique color, a different detail, something special and beautiful. Because of that we couldn’t make a travel guide using words and explaining places. The best way to show Lisbon is through images, and that we have a lot. Our album is packed with great shots. If you are looking for hotels check them here! Beautiful building covered with “Azulejos”. From ordinary houses to palaces, from fountains to park seats, the tiles are everywhere. Called “azulejos”, they are an Arabic heritage and give to the city a unique and colored look. Other post card image from Lisbon is the electric tram. The yellow “elétrico” runs all around the city. The “Elétrico” near the Cathedral. You can take the line 28 that passes through a historical neighborhood like: Alfama, Graça, Baixa-Chiado, Bairro Alto and also passes by Martim Moniz, a multiethnic area with cool shops and busy artistic square. Enjoying the weekend at Praça Martim Moniz. Most of the places we reached by “elétrico” or walking. But if you really want to understand the history behind the beautiful places I do recommend taking a walking tour. We did one with Lisbon Chill Out Tour, and it was super! A big thanks to Miguel, our guide! Another great way to explore Lisbon is to get in touch with one of the vacation photographers from Localgrapher. They are professional photographers and local experts, so you get to know the city and have a professional photoshoot from your vacations. The way up to the castle is a difficult path. The tiny streets made us get lost a couple of times. The fortification dates from 11th century and it is an important piece of Portugal`s history. Nice to walk inside the walls and see families living there. The cathedral is located in the old part of the city, close to the castle and Alfama area. The building was constructed in 1147 over an ancient mosque. The build is beautiful inside, really impressive. Barrocan style church built in 1966. It is a huge building, the dome can be seen from all over the city. Nice square with a church and an amazing view. There you can rest, drink a beer or a “galão” (coffee with milk) and enjoy the city view. Great place to go after a walk in Feira da Ladra, the local flea market. It is the biggest flea market in Lisbon. Started back on the 13th century and every Saturday it is packed with people, antiques, interesting things and old crap stuff. Located beside the National Pantheon, the market starts around 7am in the morning and goes till 2pm. Take care with pickpockets while visiting there. This is one of the oldest areas of Lisbon. The neighborhood began with the Romans, but the Arabs are the real responsible of making this a unique area. Small alleys, staircases, old tiled houses and flowers, a beautiful place frozen in time. Talking about ancient places, one interesting thing about Lisbon is that the city is really old (its history dates from 3.000 years ago) but it doesn’t look like an ancient capital. The main reason is the earthquake that destroyed the city in 1755. The town needed to be rebuilt from the sketch. The Alfama neighborhood was one of the few places that survived from the earthquake. With avenues and big squares the “new” Lisbon city center is beautiful. Walking around Liberdade Avenue, Baixa-Chiado, Rossio and the quays you will find amazing places. Impressive Square in front of the Tagus River. Surrounded by the ministries building is a place full of bars and a wine tasting spot. If you don’t want to climb one more hill, the Santa Justa elevator is a solution to go from Lisbon city center (Baixa) to Bairro Alto. For a ride you will have to pay 5€. Actually it is a funicular, however everybody calls it as an elevator. It connects Bairro Alto with the bottom of the city, near to the river. That is a super cool place, a mix of art, food and business. 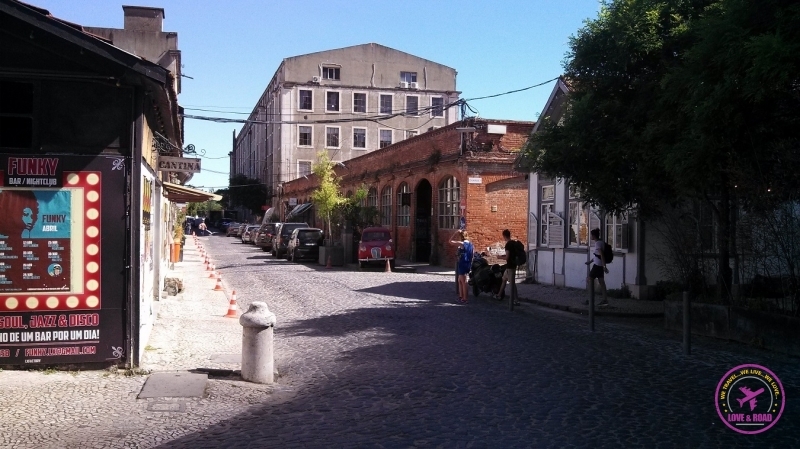 Close to the bridge 25 de Abril, it is located in old warehouses that have been transformed into a cultural center. Nice spot for a happy hour, dinner or to just walk around and see some nice street art. The bridge connects the Alcântara neighborhood to Almada, the other side of Tagus river. Its name is a tribute to the Carnation Revolution that happened in Lisbon on 25th of April 1974, which ended the longest dictatorship in Europe. From Cais do Sodré you can take a boat to Cacilhas and enjoy a good lunch or dinner. This is a picturesque neighborhood full of restaurants and beer houses. You can see Lisbon and the river, it’s stunning. Great place for seafood, we will talk about it in our Portuguese cuisine article. From there you have a nice view of the city and the Tagus river. Worthy the walk. And if after doing all this (not in the same day, of course! ), you still have some energy to enjoy the night, go to Bairro Alto! We went there a couple of times and always had great fun. Miguel talking about the “Bairro Alto”. As the name suggests it is on the top of a hill, you can walk or take one of the elevators till there. During the day is a quiet and beautiful place, at night is the busiest area in town. There you can find people from all around the world, drinks and fun. Believe it or not, this list didn’t finish yet! A bit far from the center there is a neighborhood called Belém and it is amazing. Nós é que agradecemos por dividir os conhecimentos com a gente. Não é possível entender a cidade se não conhecermos um pouquinho da história. O Tour e Miguel nos ajudou a desvendar melhor Lisboa e se apaixonar pela cidade. Obrigada por mencionar nosso blog facebook do Lisbon Chill Out Tour. E acompanhe a gente, tem muita coisa legal ainda por vir! Muito bom! Parabens pelas escolhas, poucos turistas se aventuram a atravessar o rio e explorar Cacilhas. O casal de portugueses que nos hospedou em Lisboa falou muito bem de Cacilhas, daí não resistimos e fomos conhecer. O passeio é lindo, o lugar é um charme e a comida deliciosa. Boas viagens, quem sabe ainda nos encontramos pelo mundo! You guys just made me miss Lisbon a lot! So happy that you liked the post. It´is always good to receive positive feedback, especially from a Portuguese person. You know better than us how magical Lisbon is! What a great city! It is high on my list of places to see. Love the color and love exploring tiny streets. This is a very detailed list of places to see. Wonderful! I’m glad you liked the guide! And put Lisbon on your future travel plans, it´s a great city to explore, full of personality! Good to know that you liked Lisbon, it’s a great city indeed!! Maybe we can meet in Lisbon next year, summer time!! Great post! I’m heading to Lisbon soon and this had made me even more excited to be on the ground and wandering around. And thanks for the walking tour recommendation! Enjoy Lisbon and don’t forget to eat the “Pastel de Belem”! It’s SOOOOO delicious! Street Art around the world.